Minarik Drives' RG500UA consists of a full-wave, four-quadrant regenerative SCR drive that provides smooth motoring and braking torque for brush-type DC motors from 1/8 through 2 HP, for a single or bi-directional variable speed, without using mechanical contactors. Slide switches allow the RG500UA drive to accept a 115 or 230VAC input to run 90 or 180VDC motors. The tach feedback mode virtually guarantees constant set speed under varying load. Applications with overhauling loads, rapid deceleration, basic positioning and high duty cycle reversing and braking benefit from this versatile regenerative drive. 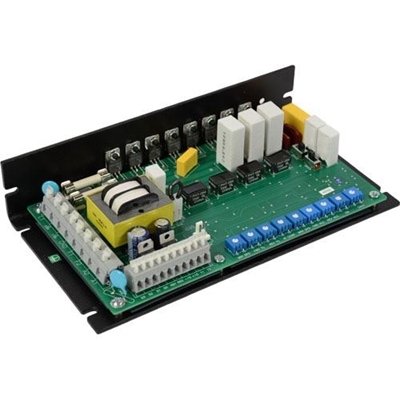 *Heat sink kit 223-0235 must be used when the continuous output current is above 7 amps.